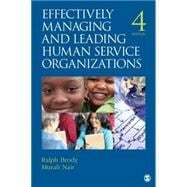 Effectively Managing Human Service Organizations is and continues to be a highly used core textbook for courses on human service/social work administration. The book is highly practical and takes students through the nuts and bolts of managing a human service agency (from strategic planning, to problem solving, increasing productivity, supervising staff, and seeking funding). Its value and distinction among competing texts is that it offers a practical, skill-building approach, which is well received by students and faculty.The new edition will be expanded to included much more content on leadership, as this is an area receiving more attention in administration courses and social service agencies as well.